A new exhibition of contemporary bespoke furniture, designed by some of the UK’s most distinguished craftspeople, will launch this autumn at Design Centre, Chelsea Harbour from 2 until 5 October 2018. The exhibition represents an exciting collaboration between The Furniture Makers’ Company, a City of London livery company and Design Centre, Chelsea Harbour, the world’s premier design destination. These two design bastions will come together for the first time to host a selling exhibition of luxury furniture designed and made purely by Bespoke Guild Mark holders. The Bespoke Guild Mark, awarded by The Furniture Makers’ Company, is the ultimate accolade for designer-makers, recognising excellence in design, materials, craftsmanship and function for exquisite pieces of furniture. Transforming an idea into reality takes passion, invention and vision; from seeing the potential of materials and respect for artisan processes to an openness to innovation. This curated exhibition will present a range of work of astonishing breadth, scope and artistic merit; with simple forms and strong silhouettes, many have a more modern pulse. An impressive rollcall of established designer-makers and new talent from the vibrant British craft scene include Matthew Burt, Byron & Gómez, Jonathan Field, Marc Fish, Tim Gosling, Alun Heslop, Edward Johnson, John Makepeace OBE, Rupert McBain, Laurent Peacock, Jake Phipps, Angus Ross, Rupert Senior, Katie Walker, Waters & Acland and Waywood. 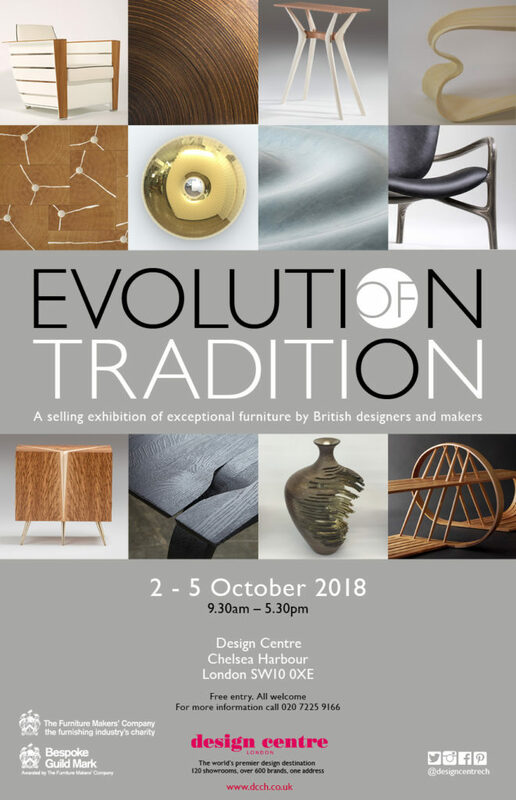 Attracting top designers, architects, international collectors and style-seekers, the ‘Evolution of Tradition’ curated exhibition will be an opportunity for visitors to gain a greater understanding of how one-of-a-kind designs are conceived and made, as well as acquire unique work. In an increasingly fast-paced world, experience the beauty and creativity of time-honoured skills from masters of their craft.